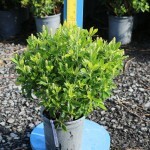 A small, compact shrub with dark green foliage. It has an abundance of white, fragrant flowers in mid-summer. They are held in an upright manner, like candles. Fall foliage color is golden yellow. 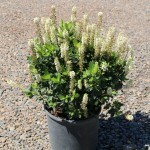 It prefers full sun to part shade and is tolerant of medium to wet soils. Use in a shrub border, foundation planting, or near moist areas.